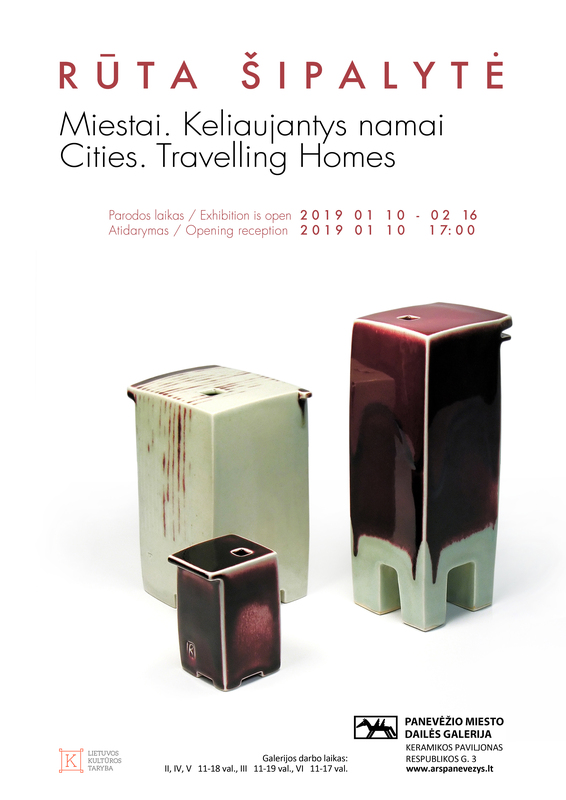 Opening in January 10, at 5 p.m.
“Travelling homes” are those “inner homes” we have in mind when we say “I’m at home.” When I visit foreign countries, I sometimes feel insecure and need time to adapt to a new reality. It is then that I feel the urge to “return home,” to evoke the sensation that “I’m at home,” to maintain my cultural identity and enrich it with new experiences without losing authenticity. That is why that sensation of “I’m at home” always travels with me all over the world – in megalopolises, art centres, and the like. A home, hive or dwelling is typically associated with vitality, cosiness and safety. Within such a context “a home” inside a person becomes alive and travels with us everywhere at all times; it travels in a different human dimension, in alternative reality – within a human heart. Such journeys offer a lot of experiences and associations I have tried to convey in my compositions Travelling Homes, Always with Me, There and Here, I’m Coming, Inside, In Bloom, You Must Wait and others. Rūta Šipalytė was born in 1973 in Vilnius, Lithuania. She holds a Master of Fine Arts degree from the Vilnius Academy of Arts, where she studied ceramics between 1992 and 1998. Since 1994, the artist has participated in group exhibitions and international ceramics symposia in Lithuania, Latvia, Estonia, Belgium, Denmark, The Czech Republic, Croatia, France, Germany, Ireland, Italy, Norway, Poland, Canada, USA, China, Taiwan and South Korea. She has also held several solo exhibitions in Lithuania and abroad. Among her significant accomplishments are a fully funded, four-month residency at the Nordic Artists’ Centre in Dale, Norway in 2000. In 2008, Šipalytė was awarded a finalist prize in the Taiwan Ceramics Biennale, which was held at Taipei County Yingge Ceramics Museum in Taiwan. In 2010 Rūta was invited and created ceramic artwork for permanent installation in the Eastern Europe Ceramic Museum which are part of the FuLe International Ceramic Art Museums in Fuping, China. In 2015, the artist received an honorable mention at the 8th Gyeonggy international Ceramic Biennale in Icheon, South Korea. In 2018, she was awarded an International Bronze Prize at the Martinsons Award / International Ceramics Competition in the 2nd Latvian Ceramics Biennale at Mark Rothko Art Center in Daugavpils, Latvia; her artworks were selected to the European Ceramics Context 2018 I Curated exhibition at Bornholm Art Museum in Gudhjem, Denmark. Since 1999, Šipalytė has been a member of Lithuanian Artists’ Association. Between 2011 and 2015 she served as a lecturer in the ceramics department at the Vilnius Academy of Arts. Her works are held in numerous international collections and a number of commissioned ceramic architectural installations can be found throughout her native Lithuania. The artist currently lives and maintains a private studio in Vilnius.